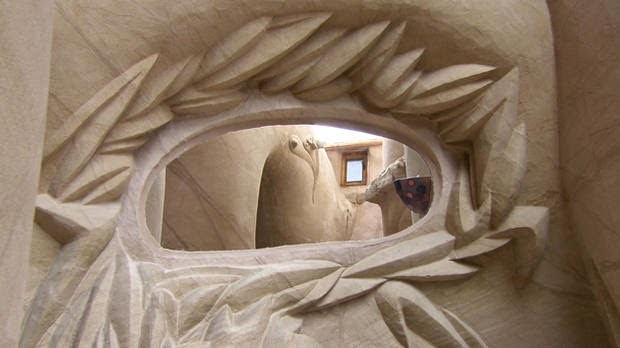 Here's an amazing artist.................Ra Paulette is a true New Mexico visionary. 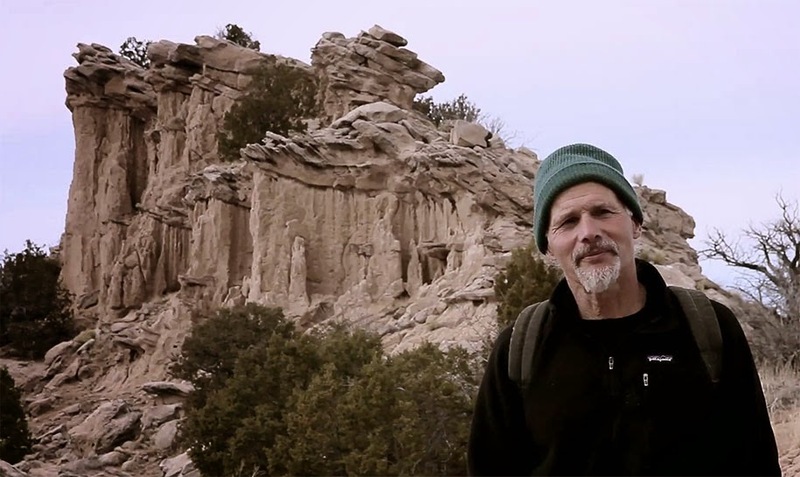 "My final and most ambitious project is both an environmental and social art project that uses solitude and the beauty of the natural world to create an experience that fosters spiritual renewal and personal well being. 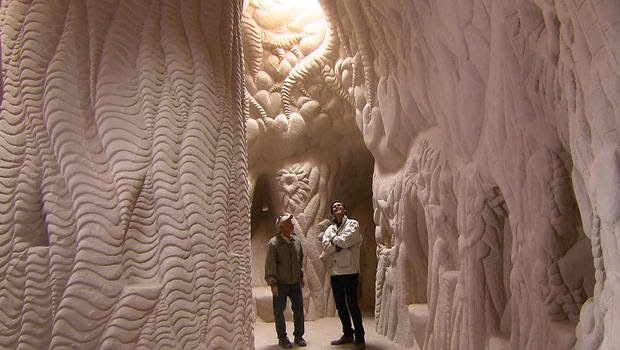 It is a culmination of everything I have learned and dreamed of in creating caves. 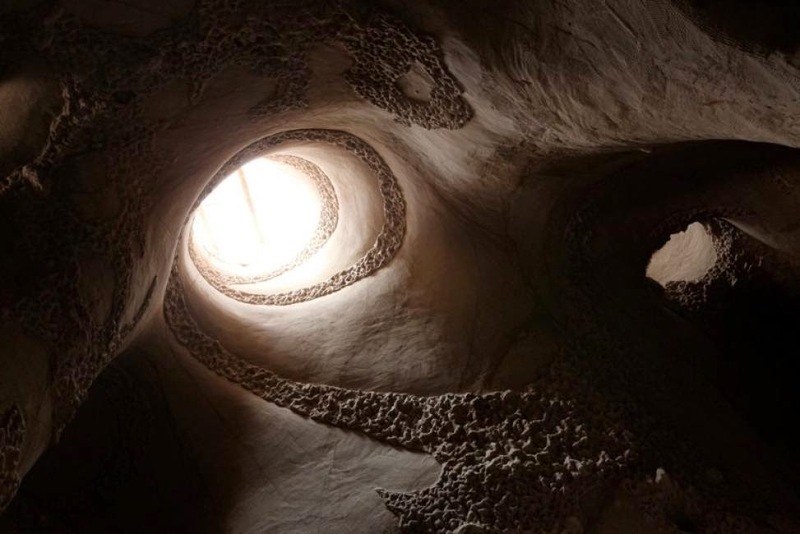 A mile walk in the wilderness becomes a pilgrimage journey to a hand dug, elaborately sculpted cave complex illuminated by the sun through multiple tunneled windows. 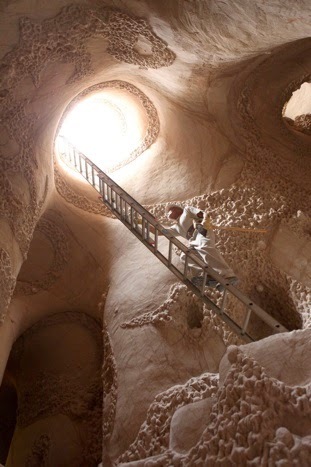 The cave is both a shared ecumenical shrine and an otherworldly venue for presentations and performances designed to address issues of social welfare and the art of well being...............In social art, creating the work of art is not the objective in itself, as in an exhibit, but is a means to bring about social change. The response to the artwork is not merely left to its audience as an endpoint in the process but is an element in a larger encompassing creative process." I had a very encouraging synchronicity the other day, and I've been pondering it ever since. It's been an enormously stressful "holiday", one I won't forget soon. It began with going all the way to Phoenix for an exhausting outdoor arts festival, and for the first time in 40 years, not even making my show fee in sales. I remember thinking that the show was a painful reminder that that part of my career, and perhaps that prosperous time for so many of us........was truly over. Then on the closing day of the show I received a call from my friend, who was house sitting and visiting Tucson for the winter, that her beautiful daughter, Amaranta, had been killed in an accident in San Diego. I rushed back to take her to the airport and console as I could. A few days later I received a call that my mother, who was in a memory care assisted living facility that has been home to her for years had been moved to the hospital and could not return because she had CDF, an infectious intestinal disease the elderly get. Then began two weeks of sitting by her bed expecting her to die, her being moved to a temporary rehab facility, being informed that she could not stay more than a week because she was dying and hence not "rehab", also being told that she couldn't go back to where she was living because she had CDF, and being also told that she couldn't have hospice because she was in a "rehab" facility. In other words, I had 5 days to find a place to live for a dying woman, and on top of it all, most places wouldn't take her because she had CDF. And because she needed skilled nursing and I have turned my house into a B&B, and have renters, I couldn't bring her to my house either, plus she needs skilled caretakers. Hows that for dealing with the "Insurance Machine"? I now fully understand that insurance corporations really do rule the world. I confess I am proud of myself that I did find a care home on short notice that I could afford, one that would take my mother, did move her there, did engage hospice (once she was removed from the rehab and could become medicare eligible), and she is now comfortable and actually getting better. Jeanne, Amaranta's mother, is back at my house dealing with her grief as best she can. A lot of death, at the Solstice. Needless to say, I've been emotionally exhausted as well as physically. And in all honesty, anyone who has been a caretaker for the elderly, or people with dementia for a long time knows the ambiguity of loving the person, and also wishing they would pass so their own life could go forward. You feel grief, shame, and anger, all at once. The Ladybug raised my spirits, and I carefully placed it on a houseplant, and I haven't seen it since. I looked up "meaning of ladybug" on Google, and was surprised to learn that this little bug has a lot of symbolism associated with it, beginning with its name. Oh, and I might add that in the midst of all this the mask I've been working on currently is a new "The Virgin of Guadaloupe" for the performance my friends and I hope to create at the World Parliment of Religion in 2015. The "Lady's Beetle" seems to me like an encouraging visitation indeed! Legends vary about how the Ladybug came to be named, but the most common (and enduring) is this: In Europe, during the Middle Ages, swarms of insects were destroying the crops. The farmers prayed to the Virgin Mary for help. Soon thereafter the Ladybugs came, devouring the plant-destroying pests and saving the crops! The farmers called these beautiful insects "The Beetles of Our Lady", and - over time - they eventually became popularly known as "Lady Beetles". The red wings were said to represent the Virgin's cloak and the black spots were symbolic of both her joys and her sorrows. Many cultures view ladybugs as lucky, and a great deal of superstition surrounds these small and stylishly outfitted insects. As often happens with superstition, it is actually a bit difficult to determine why ladybugs came to be viewed as lucky. One interesting thing about ladybug superstitions is that these superstitions are so universal: usually, superstitions about living things are quite varied, with different cultures attaching different meanings to everything ranging from black cats to mirrors. The most likely explanation for the general view that ladybugs are lucky is their dietary habits. 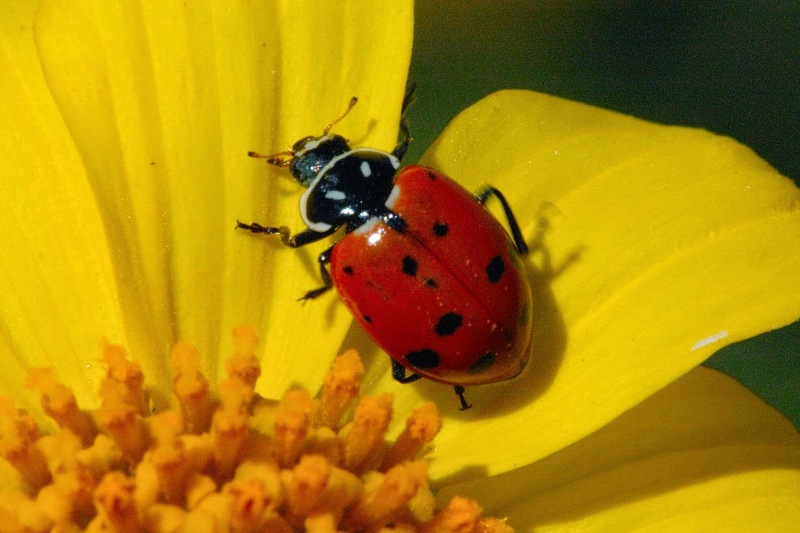 Ladybugs eat harmful crop pests, so the appearance of ladybugs would have been welcomed by farmers and gardeners. The appearance of a ladybug would also have been viewed as a blessing. One of the most common superstitions about ladybugs is the idea that killing a ladybug will bring down bad luck. This would support the idea that ladybug superstitions evolved as a form of protection for the ladybug population, ensuring that the insects could travel unmolested. Many cultures also link the sight of a ladybug with future luck in love, good weather, a financial windfall, or the granting of wishes. Having a ladybug land on you is supposedly to be particularly lucky in some cultures, and some people believe that when a ladybug lands on an object, that object will be replaced by a new and improved version. In some Christian societies, especially in Europe, the ladybug is linked with the Virgin Mary, also known as Our Lady to devout Catholics. According to legend, the spots on the ladybug's back symbolize the Seven Sorrows of Mary, and ladybugs were sent by the Virgin to protect crops. The color of the beetle is the same as the red cloak of Mary, often portrayed in art. This explains the origins of the name “ladybug.” Ladybugs are also known as “lady beetles,” or “ladybirds,” other references to the Virgin.